This month’s episode features Matt Swenson, who is another StrengthsFinder all-star. He helps his clients use their Strengths to improve the well being of the whole person. Lisa’s interview with Matt provides cool tools to help you apply your natural talents to your wellbeing. If you are ready to create some healthy strengths habits, then this is the interview for you. Matt has a background in international business, sales, coaching, sales management, marketing, product development, and athletics. Those unique experiences roll up to offer you a unique perspective on wellbeing that you can apply to all areas of your life. In fact, Matt brings strengths based development to five key areas of life. They are: career, social, physical, financial, and community. As you listen to the interview, you’ll hear about how to apply these in his Wellbeing Wheel Activity. You’ll also hear his ties to the concepts of Autonomy, Mastery, and Purpose from one of our favorite books, Drive by Daniel Pink. Fun facts: Matt busts out a Vanilla Ice rhyme in our interview. Despite how you might stereotype someone who leads with Deliberative and Analytical, Matt shows that you can’t assume you know how people will act based on their external or assumed traits. It’s worth a listen! Also, Matt is the artist behind Djonk, an Americana art business. Lisa bought one of his pieces. 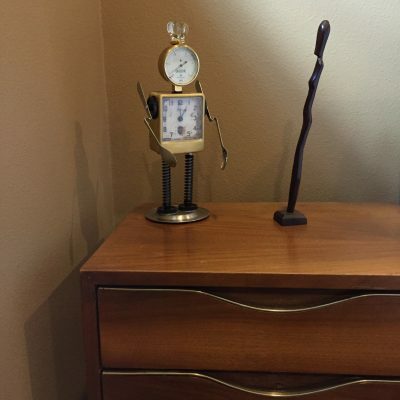 This robot is made of upcycled “junk” and now lives in her guest bedroom to greet friends. You’ll find more about his “Swedish for Junk” name in the interview. You can see her robot, named Gauge, pictured here. View others through the Strengths lens, rather than based on attitude, demeanor, or clothing. When dealing with people (whether at home or on the job) try to understand their strengths, and where they are coming from, rather than what is most obvious. You’ll often be surprised when you look a little deeper. It’s also a great exercise in listening to understand. Before you meet with someone, spend 60 seconds reviewing their talents so you can customize your conversation to resonate better with them. Look up one of your StrengthsFinder Talent Themes and consider how you can use it to full effect that day. Flip through your Top 5 strengths and come up with one new habit to implement. Focus on the five essential elements of wellbeing. Matt recommends the book, Wellbeing: The Five Essential Elements, by Tom Rath and Jim Harter, which takes your Strengths and helps you to apply them to you whole life. Their five essential elements of wellbeing are: career, social, financial, physical, and social. If things are out of alignment, it’s likely one is zapping the life out of you because it is not getting positive attention in your life. Use Matt’s wellbeing wheel to identify when you are at your absolute best.Once you identify when you are at your best, make sure to do the most important things during that time. This provides the most efficient utilization of your energy, and takes pressure off of the rest of the day. Matt also gives a great example in the interview about a guy who was draining his own energy on the way home from work – all based on his habits. As he used the Wellbeing Wheel, he figured out where he was sucking his energy away and found a rejuvenating fix for his drive home from work. Realize that habits are things that can help or hurt you. For example, if we meet a new person who seems similar to a good person in our lives, then our minds tend to compartmentalize them together (to make things simpler). However, if we meet a new person who seems similar to a person who has hurt us, it is very unfair to lump them together. This is not fair to the new person, and undermines their uniqueness. Matt’s StrengthsFinder and wellness practice is called Metamorfos. His Americana art site (pronounced Yonk, which is Swedish for junk), is Djonk. Matt’s StrengthsFinder practice guide is Raw & Refined. Check out the Wellbeing Wheel on pages 81-86 to see the tool we referenced in the interview. Many of the concepts that Matt Swenson uses are found in the book Wellbeing: The five essential elements by Tom Rath and Jim Harter. 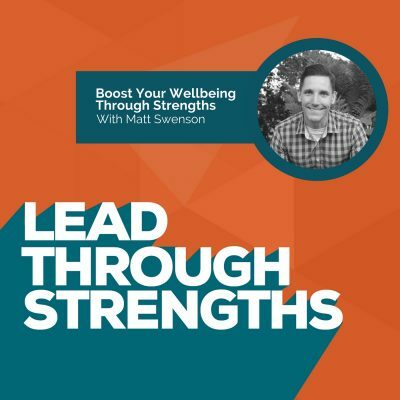 Lisa Cummings: You’re listening to Lead Through Strengths, where you’ll learn to apply your greatest strengths at work. I’m your host, Lisa Cummings. I got to tell you, whether you’re leading a team or leading yourself, it’s hard to find something more energizing and productive than using your natural talents every day at work. Today’s guest is going to give you some really cool perspective on the energy part of your talents. He’s one of my strengths pals out there, because he also founded a strengths-based development company. His is called Metamorfos. He’s going to bring you some really cool tools to help you apply your natural talents to your well being. We’ll get into all sorts of cool career development talk and even a bit on his Americana art, which I proudly own a piece of. Matt Swenson, welcome to the show. Matt Swenson: Hi, Lisa. Great to be here. Lisa Cummings: Because you’re one of my strengths buddies out here, we’re just going to dive right into the meat of it, because I’d love to get your opinion so people can hear the difference of how strengths come up in different roles. You’ve been in medical sales. You’ve been in marketing. You’ve been a full-time strengths evangelist like I am. When you look back, talk to us about how you’ve seen your top talents look different on you, as you think about them in different context. Matt Swenson: That’s a great question. It’s an interesting question because had I understood my strengths and known them at a younger age, it would have helped give me better direction in my life, in being someone who, when we look at my strengths, my top five are Strategic, Learner, Achiever, Responsibility, and Deliberative. I do spend a fair amount of time really thinking through things. Luckily enough for me, I’ve got Activator sitting at number seven, so that really balances my Deliberative. In fact, I look at it as saying that Deliberative for me isn’t a break, and Activator isn’t an accelerator. When I strategically combine the two together, it’s the perfect speedometer for whatever I need to do. Lisa Cummings: Nice way to weave those together. Matt Swenson: It seemed to work. It makes sense for me. That’s where I like to start with strengths is when I’m coaching someone, it’s helped them understand it for them, and then make it others oriented, but circling back to your question, really I spent, I’m going to have to say, over 40 years of my life focusing on developing who I wasn’t, and focused on weakness, and really trying to drive things specifically through working. I had my first job when I was in fourth grade; I had a newspaper route. I’ve really never not had a job since that time. When I was introduced to strength, it changed my perspective on the world so greatly, I couldn’t continue to go forward and do what I was doing. I had to leave my job, really immerse myself in strengths and, like you said, become an evangelist for it. Everywhere I go now, I see things that crop up in my head and say, “That could be that strength. I’ve got a better way to understand this person.” Understanding strengths quickly made me realize that when I was getting frustrated with people prior to understanding strengths, I literally was going under the assumption that they were doing things to make me mad intentionally. Now, because I understand that they are unique and have their own Individualization, I do, too, and I need to adjust my lens to understand them, and strengths gave me that common language and that understanding that people are really truly being themselves, and that I can follow that idea of saying that always assume positive intent, and when in doubt, ask. Lisa Cummings: It’s really cool hearing these different contexts in the jobs and the context of different phases in your life when you were young and you were working on fixing yourself, and then this mindset shift that strengths viewpoint has given you, and looking at people differently and seeing that it’s not all about you. It’s about them and that they’re actually processing their own stuff right now. What a cool set of revelations. It’s three layers of that going on. Matt Swenson: It really was. I think that’s how I started to try to refine my own strengths, but realize how often I was pulling people away from theirs. I quote pretty extensively some numbers and information from a gentleman named Daniel Kahneman. He talks a little bit about a study that he worked on that statistically shows that 70% of the time, or as we’re interacting with other people, it’s emotionally biased. That means that only 30% of the time am I really rationally interacting with other people. The idea of strengths in my mind really helps me not irrationally or emotionally decide who somebody is or why they do what they do. Instead, it gives me that great common language to really start to understand them and see past attitude or demeanor or clothing. I can really know that deeper version of who someone is. Lisa Cummings: It really gets past the surface. Now I’m going to have to admit, because I think I’m doing the anti-Kahneman thing here, because I have this secret I learned about you speaking of context, something fascinating from your way back. I think you had some other top five talents in your university days. You talked about early career, so we’ll take it back a little further. I’ve been sitting here trying to find this in you in my mind. I’ve heard you have some special video skills. Is my research onto something here, Matt? Matt Swenson: In college, I did study … I had a Communication major and an English minor. There was an awful lot of broadcasting that went along with that. At one point, I thought, “Wow, broadcasting is pretty neat. I’d like to take part in that,” so I studied more of that. One of the courses that we took was obviously video. As a part of that, one of my counterparts in school, Jeff, he knew me pretty well, and he knew how much of a Relator I was. He wanted to push me a bit and see if I would actually do something outside of my comfort zone. He asked me to take the starring role in his video, which was a replication music video of Vanilla Ice. Matt Swenson: That’s right. That’s right. That even ages me even further to know that when I was in college, Vanilla Ice was popular, but nonetheless, I surprised him. Lisa Cummings: Did you shave your eyebrow? Matt Swenson: I did not. I didn’t go that far, but I did don the Miami gear, just so I could really immerse myself in that role of Vanilla Ice. I actually set aside my relater and I took the challenge of learning and achieving something I wouldn’t normally do and I did a rap video to Ice, Ice Baby. Lisa Cummings: Oh, man. Do you still remember lines from this because I can give you a little baseline? Matt Swenson: I can recite lines in my sleep from this song. It’s one of those things that comes along, but you sure you really want me to rap on your blog? Lisa Cummings: They want this so bad right now. Ding, ding, ding, ding, ding, ding, ding. Lisa Cummings: Yah!! That was the best. That’s some serious memory going back. Thanks for that. I love it. Matt Swenson: You’re welcome. You’re welcome. Lisa Cummings: If anybody wants to pull in stereotypes of Deliberative or Responsibility being too serious, there you go. You just gave the living example of how you got to go a little deeper. It’s not just what’s on the surface. Can’t make assumptions. Matt Swenson: That’s right. Sometimes I can break loose and have a little bit of fun, but other times, I think I’ve had people definitely tell me that I’m one of the more difficult people to read, because I definitely will tend to be introspective with my actions. They’re more inward rather than outward. Lisa Cummings: That makes sense. Matt Swenson: It is interesting. When you look at my top 10, which I don’t necessarily think that I use all of those top 10. I think I really go up to number 8, so after Deliberative, I’ve got Relator, Activator, and Individualization. I’ve got 4 strengths in my top 10 that are executing and 3 that are strategic thinking. Lisa Cummings: That tends to bring you a lot of that inward focus, the cerebral kind of guy thing that you’d expect. Matt Swenson: Maybe too much at times, but luckily, Activator can balance. Lisa Cummings: If we shift gears to full on well being, because I’ve had a great set of questions and demand for this topic. When I read your book, Raw & Refined, I viewed it almost like a cool workbook. After taking StrengthsFinder, you can get into it and put this stuff to use and move your talents from the raw state to a more refined state. My very favorite thing is there is this thing that you called a well being wheel. Can you tell us more about that and how you’ve used it with clients? I think everyone is going to love this thing. Matt Swenson: I appreciate that. I created the book for a very specific reason. I felt that there was a need for something to help people build just small step habits. Because I’m a numbers guy, because I’m analytical, I always like to back things up with that, and I know that 50% of the time, when somebody writes something down, 50% of the time, they are more likely to take action and succeed with it. The idea behind Raw & Refined was to give people an action guide that could build habit in quick, easy steps, something that wouldn’t take them 50 chapters of a book; they could do in just a couple minutes a day tops. I rolled it into well being. The idea of well being is something that Gallup developed, but not everyone chooses to use. It was written by Tom Rath and Jim Harter. To me, it’s one of the most amazing books they have because this is where strengths differentiates itself from so many other programs because it creates an understanding that we are not the four walls of work. We also have a social area of our life, we have community, physical, financial, and career, those five areas. In well being, we need to use our strengths in all of those areas for really good success. I can say specifically for me personally that I was so focused on the career portion of trying to develop my life, I let those other areas really sink down, but then things that weren’t ideal or perfect in those other four areas would affect my success or my engagement at work. A great example would be I’ve got a client that has to drive one hour, one way to work. That’s two hours a day. He wasn’t using that drive time to enhance his well being. What he actually was doing was he was listening to talk radio, generally political talk radio. By the time he got to work, he was so worked up and upset, that it usually would spill over into that, so he wasn’t doing anything to enhance his well being, which then affected how he worked. Then the same would happen on his way home. By the time he got home to spend time socially and in his community, he was again upset and worked up about things and it took him a while to come back down. Instead, during that time, we talked about the different options of satellite radio or podcasts, so that he’s using that time in a productive manner that he’s going through his strengths, which actually, funny enough, one of them was Learner, so that’s a great way to extend your Learner, but then what he was able to do was grow and build on his strengths and well being during that drive. Lisa Cummings: I love how, your well being wheel, how it’s so simple, and that it brings out things like that, because looking back in the rear view mirror, no pun intended with his drive, it’s probably easy to find that your well being is out of balance, but he may not have known that at all. It just takes the moment where you always talk about these compartments, the work and the community and the physical and the social and the financial, and that if you’re not consciously considering those, you may have no idea that you’re draining yourself because one was out of alignment. Your well being wheel just does such a great job of putting that in front of you and making it obvious what’s sucking the energy out of you. Matt Swenson: That’s a great way to look at it. I liked how you say the desire to be whole, because we are whole people, we aren’t just one thing; we’re multiple areas. That’s where I think at times the word holistic gets a little bit of a bad rap, but we are whole people, not just part. Then the idea of compartmentalizing, that even with the well being wheel, I think people could say, “Well, it seems like you’re compartmentalizing,” but, no, we’re not. That’s what we’re trying to fight against is the realization in life that we do cross over all areas. There is a connection, and if we do compartmentalize and deny it, it’s going to give us difficulties in our understanding of others, in our interaction, and really how we feel about ourselves. Lisa Cummings: I think it’s great. In his case, it was showing how he was spending his time in one block and how it was being spent unproductively. Then I’ve looked at the well being wheel. For me, at times, I can see where I am neglecting one. If I get really busy for a stretch, I think, “Okay, I’ll skip my workout for these two days, because it will let me knock this thing out.” Then I realize that’s really putting me out of whack and I’m not at my best because I’m denying one of those areas. It’s easy to make the decision in the discrete moment thinking that it’s no big deal, but if you start zooming out and seeing, “Oh, yeah, I did that four times this month or I did that ten times this month,” that has a big cumulative effect. I love that your tool makes it simple to do that. Matt Swenson: I appreciate that. That is the goal of how I coach is that when we speak of habit, we spend 40% of our day living from habit. That means that we have to intentionally focus on it to adjust and build a good habit. My feeling is that we make things much harder than they need to be. I guess I’m a guy that appreciates simplicity. Therefore, I try to share things in a matter of simplicity. I maybe even look at it this way, that the people that wrote all of the books that Gallup has are so much smarter than I am. Not trying to take their place, but what I feel like is, I can help just create a little ramp that leads people up to it where they can go deep and have success after they’ve intentionally built a habit that’s sticking. Lisa Cummings: I love that. I think of myself similarly, just with a different set of talents, where I think, “Now, they do the amazing research and analytics on it and then I can bring it to life and kind of turn it into action through training and speaking events, and so they can do the validity part of it and then I can do the bring it alive in your company side of it. Matt Swenson: Exactly. I think you do a great job of that. The time you take that you put into the podcasts or the energy that you bring to so much of what you do really, really does that, and I think that that also helps resonate and lift people. That speaks to your understanding of your strengths, but also really the well being, like you just pointed out, that making a short-term decision that could affect us long term, but another thing I think that’s pretty neat about the wheel is that I had good success helping my clients identify when they are at their absolute best. For me, personally, it honestly is probably from 5:30 in the morning until about 7:30 before the weight of the day catches me. For that 2-hour timeframe, that’s when I’m most productive and that’s when I want to handle my biggest, most important things. Often times, what we do is we choose to do the little things first and then we leave the biggest things for when we are at our weakest or our lowest or our most tired, and we want to flip that around so that we have better success with them. That’s the idea of the well being wheel, too, is to define when are you at your best? Let’s do the most important things then. Lisa Cummings: You mentioned you’re not using your number 9 and 10 as much, but that sounds like heavy focus to me, as well, that you know the right thing and you’re giving it the moment it needs so that you can have the rest of the day. This is making me think about the rest of your day. We’re talking about the whole person. We’re talking about what happens after those super productive two hours. I have to mention to them your wicked awesome Americana art. Djonk, did I say it right? Matt Swenson: That’s right. That’s right. Swedish for junk. Lisa Cummings: Swedish for junk. It’s art. It’s Americana. It’s robots, and I own one named Gauge, and they are the coolest objects. In honor of you as a whole person, you should tell us about how this part of you came to be and how it uses your talents because it’s really cool stuff. Then I looked in the mirror and said, “What am I doing? I’m not doing that.” That’s when I started to embrace the idea that I love old junk. I like things that people walk by. I like things that people throw away. Because of my Strategic side, I start seeing other repurposed ways of using things, like a walkie talkie as a head and a face, and a coffee press as a helmet and then a sugar tin as a body and springs as arms and flashlights as legs, and before you know it, I’ve built a junk or up cycled Americana piece of art. That’s what I do with my djonk, is I go and I pick, and I collect, and I look for and then I spend time deliberating on how these different pieces may represent something that they were never intended to be, and I make them into a sculpture. Lisa Cummings: It’s so cool. I love hearing the back story part of how you separated it consciously from your career and then how hearing all the Swedish design elements of you that come out. It’s really cool because there’s a sentiment like that that I feel in your art, as well, where you take these things that you would think would be old and they would need to go in a house that is full of rustic goods or maybe old country fair, if you just heard about this maybe on, say, an audio interview like we’re doing now. Then I see them. When you look at these, they’re just so cool. For me, I have a very modernist kind of house and a very minimalist style and they fit that totally. You almost give these old objects a totally new ethos, and they just reflect your brand and your simple sensibilities. I love how you can see you coming out in it, and now that I hear the bigger part of the story, I can see you in it even more. Matt Swenson: I appreciate that. That is the idea that I put a piece of myself into it, and art is always going to be in the eyes of the beholder, but overall, what I’m hearing is that people, they love to stand and try to figure out what parts are, children, parents, grandparents. They enjoy standing and looking at these, but it makes them think, and it makes them smile, but you’re right. They go anywhere. It’s not just people that are into Americana or country. I actually somehow, as luck would have it, I got a commission from Delta Airlines, and they’re putting five commissioned sculptures on permanent exhibit in the Delta Sky Club in Atlanta, Georgia. Matt Swenson: Sometimes you get very lucky on things. You’d think that they would want it to be very modern and up to date and what they wanted to play off of was the idea of old technology that’s now been replaced by a smartphone, so we did all kinds of things with old technology, from telephones to Morse code to flashlights to radios to View-Masters, just things that you no longer use anymore and oddly enough are all replaced by a smartphone. Lisa Cummings: I love that perspective. I can’t wait to go to Atlanta and be looking out for it, see if I can spot it. I also love that you’re not afraid of the commission side, as well. Matt Swenson: It’s an interesting point, especially if we turn that towards strengths. Adaptability, for me, is really, really low. You’d think I would get really annoyed by that. I’ve got my own process. There’s my own strategy behind it, but what really balances that and carries it for me is my desire to make things individualized. I want to be considered an individual and understood that way, and I think that other people do, as well. If we’re going to make art something that matches the eye of the beholder, why not give them some input. Let them share something with me that has meaning and significance to them so that when they look at it, they think of things that are them, not necessarily the artist. I know at times that’s odd because I think sometimes art is all about saying, “Well, this particular artist built this,” but that’s not my art. My art is about making people think and smile and even turning it back toward them. That’s what I’m able to get through my robot junk. Lisa Cummings: Man, it’s cool. You guys listening, check it out. Djonk, D-J-O-N-K.net, and we’ll put the links in the notes, as well, so you’ll see them. I want to take this and pivot back to your habits topic because I know you’re hot on habits, and I think it’s a great actionable way to end this last question. You and I both have focus on our top 10, and I often meet people with Focus or Deliberative talents who really love this notion of habits. You also have talked about habits as things that can help you and also habits as things that can hurt you. Say more about your perspective on them and maybe your thoughts on why can they hurt you and what do you need to look out for. Matt Swenson: If I don’t know someone, I’m going to tend to try to compartmentalize them using a great word from you to define who they are so that I don’t have to put as much thought, much time, and as much effort into figuring it out. If you have similar mannerisms to some other people that are really high in Positivity, I might try to connect the two of you together and then line you up and make a positive determination. However, I can also do the opposite where if someone has frustrated me, or hurt me, or caused problems for me, I will also then, if I run into someone else who has maybe some similar mannerisms, I may lump them together and that wouldn’t necessarily be fair because they may be very different people. If we’re following strengths, we know that they are very different. Lisa Cummings: It’s a beautiful tie back to your Individualization, as well. This is a beautiful way to end. It’s been a blast, Matt. Now that the listeners want some more of you, where should they find you? Matt Swenson: The best way to find me is you can definitely email me, Matt@Metamorfos.net or just go to my website, which is Metamorfos.net. I’d be happy to answer questions and help. There’s nothing that I love more than talking about strengths. It gets me so excited and so pumped up and it turns me into my Vanilla Ice side. I’ve got a pretty cool quote that I was hoping you might let me throw in here and finish with because it comes from a very unique person. I won’t tell you who the person is, but if I could read the quote, I think it’s pretty amazing in regard to how it ties a nice bow around strengths. Lisa Cummings: Please do it. Take us home. Matt Swenson: It says, “Most of us, I believe, admire strength. It’s something we tend to respect in others, desire for ourselves, and wish for in our children. Sometimes, I wonder if we confuse strength with other words, like aggression or even violence. Real strength is neither male, nor female, but it is, quite simply, one of the finest characteristics that any human being can possess.” That quote was from Fred Rogers, good old Mr. Rogers. Lisa Cummings: Aw, this was really a great experience. I know people are going to be renewed about paying attention to their well being because they listened today. Thank you, everyone, for listening to Lead Through Strengths and thanks, Matt, for bringing such great value to everyone. Matt Swenson: This has been wonderful. Thank you. Lisa Cummings: For everyone, just to send you away today, using your strengths makes you a stronger performer at work. If you’re always focused on fixing your weaknesses, you’re choosing the path of most resistance. Claim your talents, and share your well being with the world.